If your child is walking around the house saying “Bananaaaah” or other words that may sound a lot like gibberish, there is no need to worry. Like millions of other children and adults, they have simply fallen in love with the Minions. The world was first introduced to these adorable and hilarious characters by the movie Despicable Me but have since had their own spin-off. If the Minion craze has hit your household, you have come to the right place. 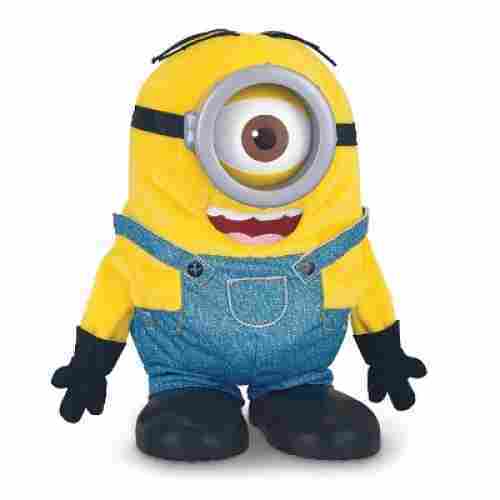 We created a list of the 10 best Minion-themed toys for your child. Not only are the toys listed geared towards children of varying ages but they are also fun and developmentally appropriate. With three Despicable Me movies, one Minions movie and Minions 2 slated for a 2020 release, these toys will remain popular for a number of years. We have updated our buying guide to include a number of new Minion-related products and all product information was reviewed and verified as accurate. You might be thinking the last thing your child needs is another stuffed animal, but they’re actually great for children especially if they are modeled after your child’s favorite character. 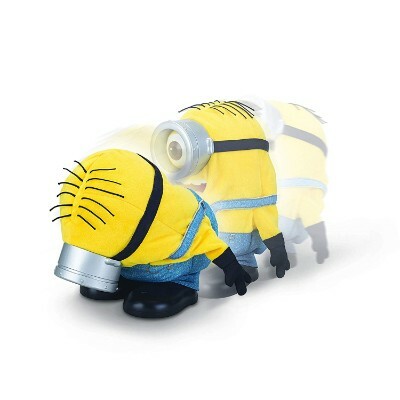 Minion fans will love the Despicable Me plush buddies that are available in both Bob and Stuart. The material of these plushies is super-soft, even the glasses, so your little one can be extra comfortable while snuggling. The Bob plush is around 5 to 6 inches tall whereas the Stuart plush is 8 to 9 inches tall, thus making them easy to carry. Whichever character you chose, these Minion stuffed animals will provide your child with a sense of security while also stimulating their imagination. The high-quality stitching gives this Minion a level of a durability that will allow it to survive countless adventures with your child. Designed with overalls and black work gloves, these toys stay true to the characters original look in the movie. Memory games are great for school-age children. 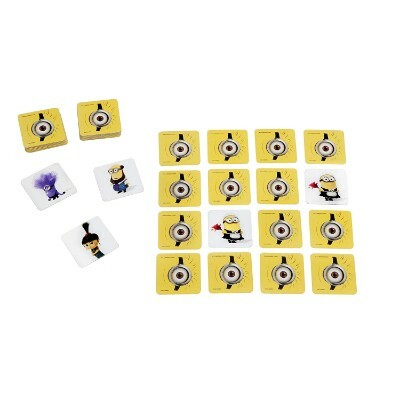 This is a Minion based classic memory game features 48 matching pairs of Minion cards. The goal of the game is easy. The player with the most matches wins. It is best suited for two or more players and kids over the age of three. It has been made from high-quality materials ensuring that it is safe for everyone. 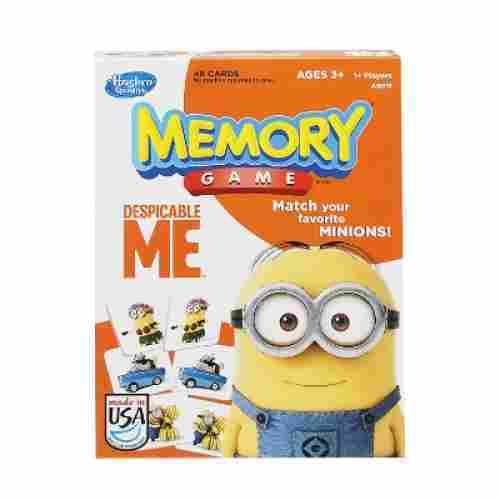 Matching their favorite Minions could not be more fun than with this game. Memory games are great for building strong cognitive skills. The remembering of who is where and what was just selected is a great way to encourage players to develop strong cognitive connections. These connections created to allow for the brain to be able to process faster and faster each time. 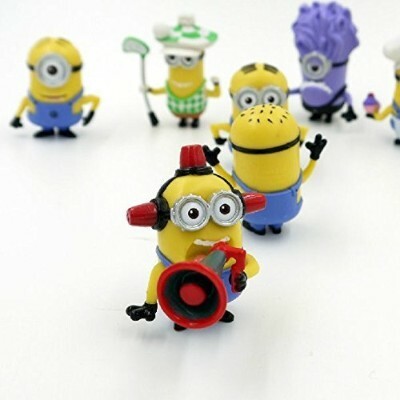 The characters of Despicable Me are all in this miniature set of figures in the most vivid colors and costumes. With zany faces that will make children laugh and squeal with delight, they are ready to be a part of any playtime happenings. 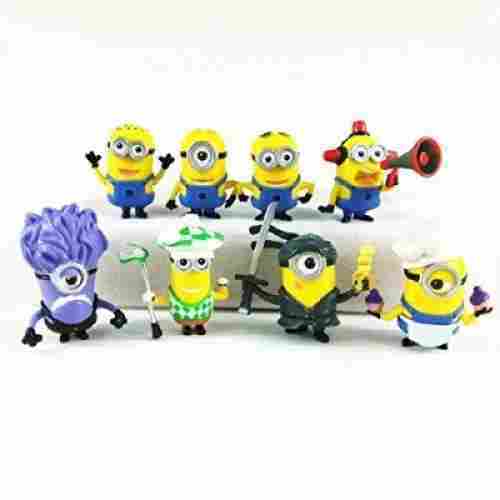 Bob, Stuart, and Kevin are joined by other Minion personalities in this eight-pack set of tiny figures that are just 1.5 to 2 inches tall. They are made of PVC plastics and are very durable. The small size of these Minions makes them easy to transport, thus allowing your child to engage in imaginative play anywhere. Their size also makes them perfect for topping cakes and cupcakes. Kids 3 years old and older will love playing with these characters that they will remember from the movies. Play acting for children is very beneficial, as they act out what they see, plus they have the opportunity to make up their own versions of the stories. 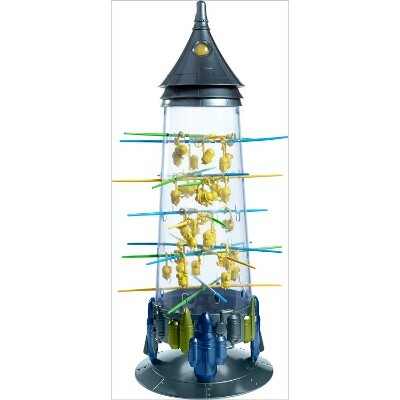 Watch your child's imagination soar with this pack of minions. Family game night just got a little more despicable but in a good way. 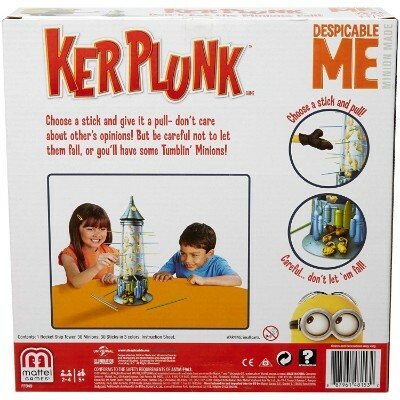 Mattel’s Kerplunk Despicable Me Minions game is fun for the whole family. Kevin, Stuart, and Bob make up the 30 different Minion pieces. Along with the Minion pieces, there are the 30 sticks composed of three different colors and the tower. 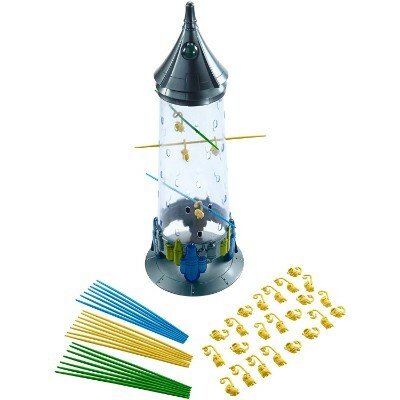 The game begins once all of the sticks are inserted into the tower and the Minions are placed inside. 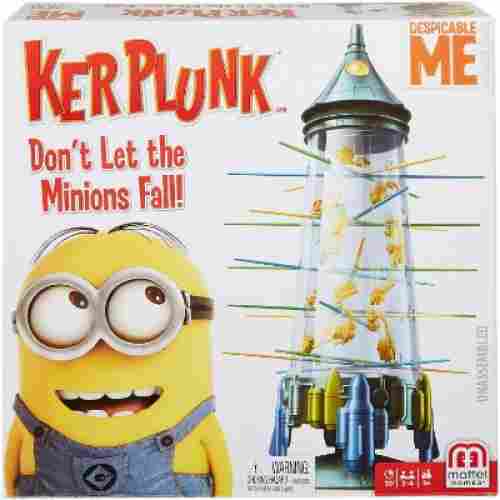 The object of the game is to remove the sticks without dropping the Minions. The player who drops the fewest Minions wins. The game requires at least two players but can be enjoyed by four total. While setting up the game may be easier for older children, the objective of the game is simple thus allowing children of all ages to play. Your child will increase their social skills by playing with their friends. Grasping the sticks will improve your little one’s fine-motor skills. Your child will develop better concentration and problem-solving skills as they work to complete the objective. Each of the game pieces are durable, thus your family can continue to play this as your child grows. 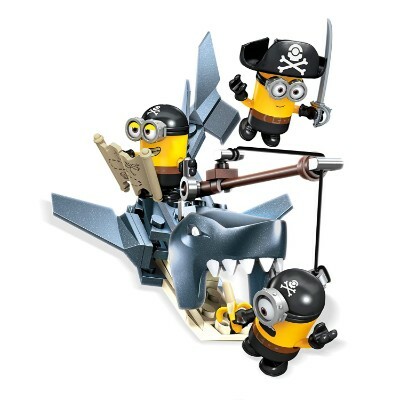 Mega Bloks and Minion characters come together in this terrific toy. Bob, Kevin, and Stuart get into trouble with the great white shark that kids can build and use for imaginative play. 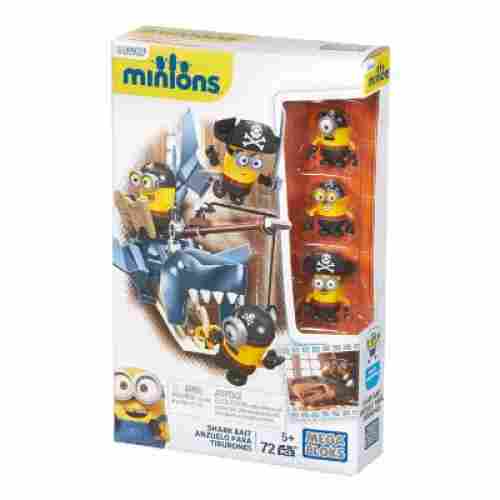 This figure pack includes three Minion character figures as pirates to build with interchangeable parts, such as hats, goggles, clothing, arms, and feet. A white shark that kids can also put together has a tail that moves and a jaw that really opens. 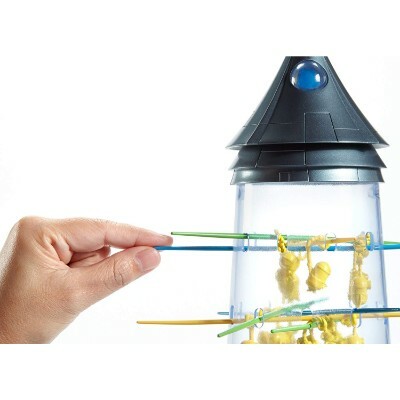 A connected fishing rod and line can be raised and lowered for the best make-believe fun and excitement. The best thing about Mega Bloks sets is that they can be used with other such sets to expand the possibilities of constructions. Children five and older will get the best use of this figure pack because it is at this age that the cognitive abilities of imaginative play begin. 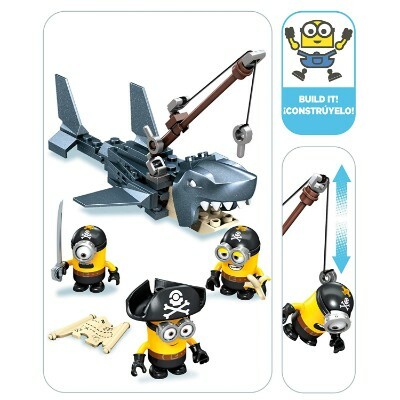 Any Minions or Despicable Me enthusiast would like to have this set Mega Blok excitement to play with or collect because it is so unique and easy to enjoy. Toys like Mega Bloks allow children to use their imaginations, motor skills, hand-eye coordination, and storytelling talents to entertain themselves and others with fabulous tales they dream up and wonderful creations using the many pieces. 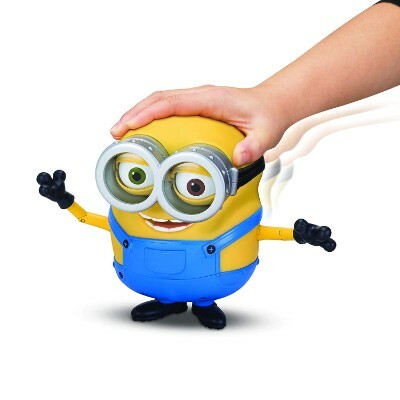 With the original Minion voice of Bob from the Despicable Me movies, this fantastic toy will get kids talking and singing along to the more than 20 tunes and phrases that it can say. Children 4 years old and older can interact and play along with the figure of Bob Minion and his adorable teddy bear Tim. Placing Tim the teddy bear into Bob’s side will activate the talking function, and by touching the pocket of Bob, he moves and speaks. Bob can move his head right, left, backward, and forward, plus he has a very soft skin that covers his upper body. 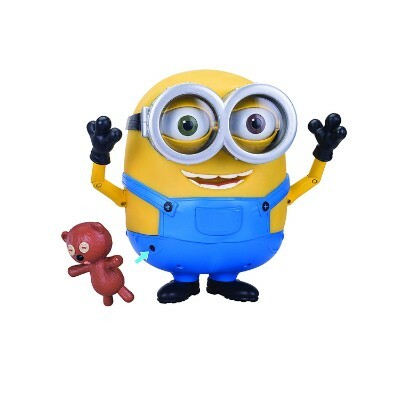 This is about as real-looking as a Minion can get in its miniature form to entertain children. With his teddy bear friend, Bob will have kids laughing and having fun as he talks and sings. He makes a wonderful buddy to carry around and hold because he is lightweight and easy to grip. The 20 preloaded songs will stimulate your child's development by having your little one singing and dancing right along with Bob. Useable in a hardback or Kindle edition of the book, this Seek & Find game is wonderful for kids when they travel or must wait in places like restaurants and doctor’s offices. For great family fun or play alone, the Minions make finding objects so fun with this fabulous colorful book. It is a quiet activity that can be played almost anywhere with others or alone. There is some reading to enjoy on the inside pages, so kids four to eight years old will enjoy the book the best. Younger children can join in the seeking fun, but may have to have the words read to them. Any age can practice their counting abilities by looking for the items, and games can be devised among groups to see who finds the most things or challenge each other to find particular items. Hunting for picture objects and characters gives children the opportunity to use the abilities to identify and then recognize items in a maze of other objects. These skills will benefit them later in life when they must search for things in real life. Being just a big plush figure would be fabulous enough, but this Minion actually tumbles and falls, but gets up on his own too. Stuart laughs and makes a farting noise which will keep kids laughing for long periods because it is so cute. The toy speaks in the same voice as the character in the movies, and it has talkback and talk features. The colors of the fabric are colorful and vibrant, and the material is very soft and snuggly. Children four years old and older will love having this toy that will remind them of the movie personality in the Minion movies. Stuart’s eyes, feet and eye goggles are all made of plastic, but the rest of him is the soft plush fabric. 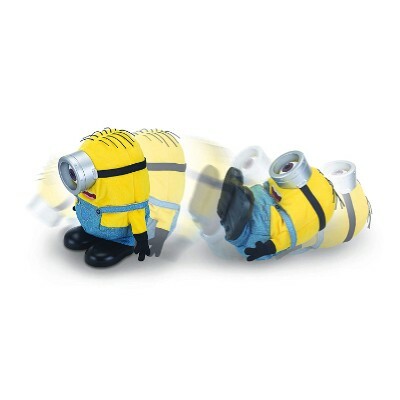 This item is great for Minion fans and those that like funny toys. Soft and plush, Stuart makes a wonderful buddy for kids as he laughs and tumbles. He is the perfect size to carry around and take a nap with too. The talkback features will increase your child's knowledge of cause and effect while carrying him around will improve your child's fine motor skills. Fart blaster makes its way to your living room. This is a horn that when the button is pressed it triggers a fart noise to be played. It has great sound effects and even features color changing lights on the top of the horn. 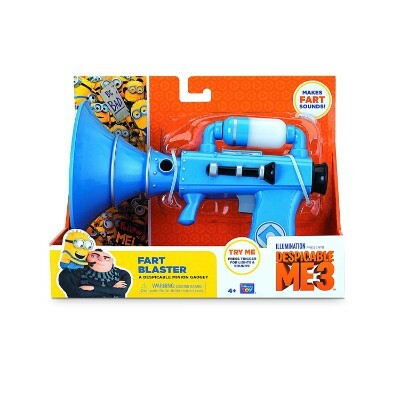 In-joke mode, the horn blaster has a 20-second delay on the fart sound making it easy for someone to come by and hit the trigger then moving on before the sound effect plays. 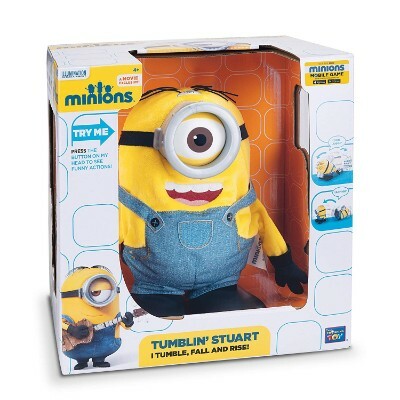 If your Minion lover is also a jokester then this is the toy for them. With a simple press of a button, your child can activate the fart blaster all over the house. Developing social and emotional skills during childhood is a great way to help ensure that your children are successful adults. Cool jokes and sound effects are a great way to encourage kids to use verbal and non-verbal skills to play together plus be able to share thoughts. This really opens a world of possibilities for them in their development. Creating your own custom minions out of Play-Doh is super fun for kids. 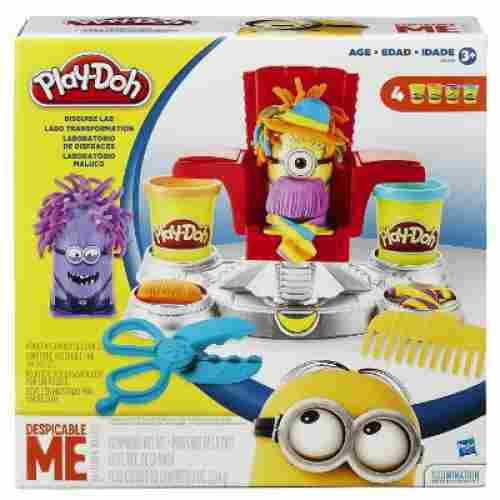 This Minion toy is a Play-Doh set that allows the kits to create custom Minions by placing the plastic yellow mold on a press and pressing out crazy hairstyles. Once the hairstyle has been completed there are additional molds to make bananas, sirens, and other molds that are half shapes to allow them to create a whole custom scene. 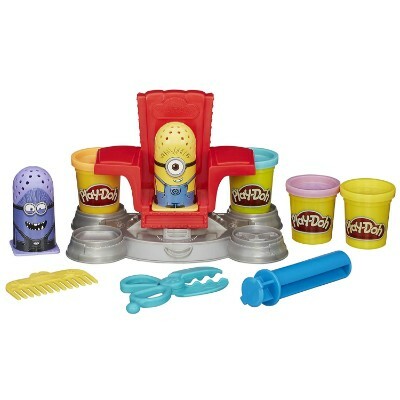 Included in the set is; two Minion character yellow molds, Play-Doh (4 colors), scissors, comb, and press base. If the Minions were not already cute enough this Play-Doh set makes them even cuter. Creating hair to disguise them is one of the funniest things that can be done. It is silly and just makes for a great time. Play-Doh is a great way for kids to give their hand and fingers a good workout. During the workout, there are enhancing their fine motor skill development. The pressing, molding, cutting, and shaping is a wonderful exercise to practice all extensions of the hands and fingers. First, toys must be fun. These should bring a wide smile to kids. To help us identify the best Minion playthings currently available in the market, we had to consider their consumer product ratings. We believe a 5 star-rated product would be more appealing than one that only has 3 stars or less. That’s why, as much as possible, we only included those with no less than 4 stars in their consumer ratings. In order for a toy to be enjoyable, it is important that it can easily be used by the target age range. We included a wide variety of minion toys that can be enjoyed independently or with a friend and by children of all ages. Toys must also be developmentally appropriate as they are fun to play with. This is actually more important than the customer review ratings. The developmental appropriateness of a toy simply means that it is able to address some, if not all, of the developmental needs of children for any given age. That’s why developmental appropriateness is often equated with age-appropriateness. While the language the minions speak may sound like gibberish, many of the words can easily be recognized. The hundreds of minions found in the movies are all voiced by one person, Pierre Coffin. The safety of these products was also considered. It was crucial for us to ascertain the level of safety of these items both in the kind of materials used in their construction or manufacture and in the way in which the different components have been put together. This is especially important among younger children as they can easily choke on very small parts. Their sense of safety is not yet that fully concrete so it’s up to us, we believe, to safeguard them from unsafe products. q: For an activity in the car or when away from home, which items would keep a child entertained for a while by themselves? For traveling entertainment try Bob Interacts with Teddy Bear, the book, one of the plush buddies or the Minions action figures set. These would all keep kids enthralled for hours either home or away. 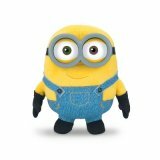 q: Are there any Minion toys that are safe for a toddler to play with? Oh yes, there are several that would be safe for very young kids and will keep them entertained too. Bob Interacts with Teddy Bear toy, Tumbling Stuart, and the Seek & Find book are all great toys for toddlers. q: Are these Minion toys for girls or boys? All of the products on this page are for either boys or girls, as there is no specification for gender. 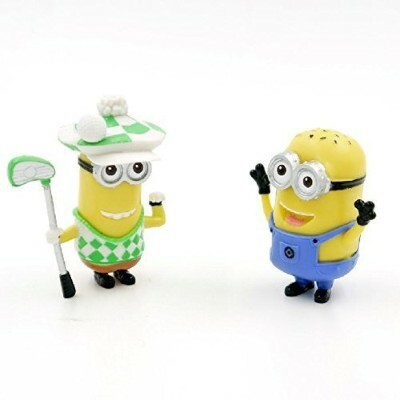 q: Do any of the Minion toys work well for an outdoor activity? Which ones are strictly for inside use? All of these toys can be used either inside or outside none are meant to be left outside for any period of time. Also, watch for the products with small parts as it could be easier to lose these outside versus inside. q: Do you have to understand the movie plot to enjoy the Minion toys? My kids have not seen the movie yet, but the toys are really cute. Certainly not. Kids can enjoy the personalities of the Minions, even if they do not know who they are or have not yet viewed the movies. They are just funny-looking and laughable with their odd looks, funny features, and fantastic costumes. No knowledge of the movies or the characters is needed for children to enjoy any of the toys either. q: How many popular Minion main characters are there? Are these collectible? The main personalities of the Despicable Me movies are the three brothers of Stuart, Kevin, and Bob. There are many other characters, but these are the heroes of the movies and the characters used for most of the popular toys. q: What is the appropriate age for kids to enjoy the Minion movies and the toys? No one is too young to enjoy the Minions. Kids may identify with them as a baby or toddler because they are so funny looking and animated. 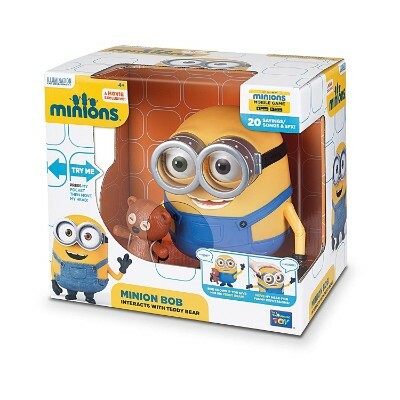 All ages love cartoon characters, even adults, so if they like to watch the Minions, then they will love to play with toys that symbolize the Minions.